Create spectacularly large bubbles with Bubble Thing. 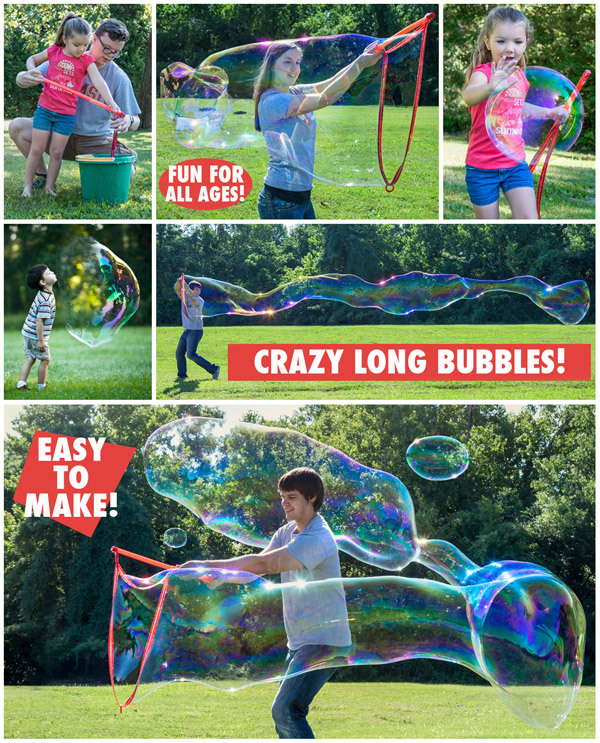 This amazing "thing" allows you to easily make bubbles up to 35 feet in length! Start by dipping the Bubble Thing's fabric loop into your specially formulated mix. Then lift it up, pull back on the slider to open the loop, and swing the thing through the air. For more fun, spin in place and completely surround yourself with an enormous bubble. Each Bubble Thing Kit includes a wand (with 90-inch fabric loop) and a bottle of Big Bubble Mix (makes 2.7 gallons). Refills of Big Bubble Mix (makes 5.4 gallons) are also available separately. 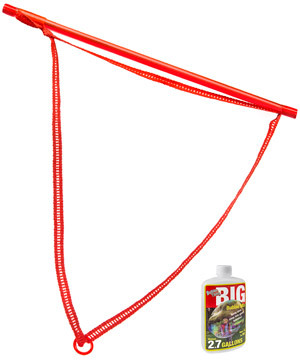 Makes bubbles up to 35 feet long! Bubble Thing is a simple contraption that makes some of the largest bubbles you've ever seen! Marvel at the wonder of bubble "snakes" 25 to 35 feet long. Creating monstrous bubbles requires just a few ingredients: hot water, dish soap, Bubble Thing Mix, and the Bubble Thing Wand. Within minutes, you'll be making amazingly gigantic bubbles. Create monstrous bubbles with Bubble Thing! 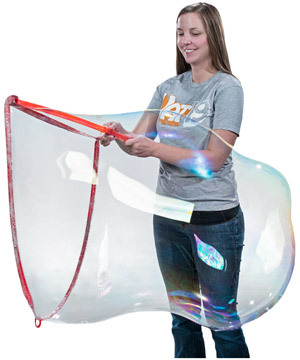 Kids aged four years and older can learn to create huge bubbles with Bubble Thing. Simply dip the fabric loop into the bubble solution, pull back on the slider to open the loop, and walk slowly. Instant bubble magic! 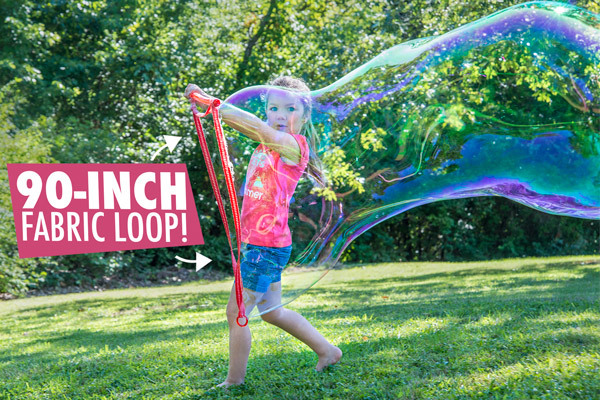 Bubble Thing's 90 inch fabric loop delivers awe-inspiring bubbles. We took Bubble Thing around the streets of our hometown to see how both kids and adults would react. Mega fun for all! The Bubble Thing Kit includes the wand and a small batch of bubble mix (makes 2.7 gallons of solution). Each refill bottle is double the size and makes 5.4 gallons of solution. 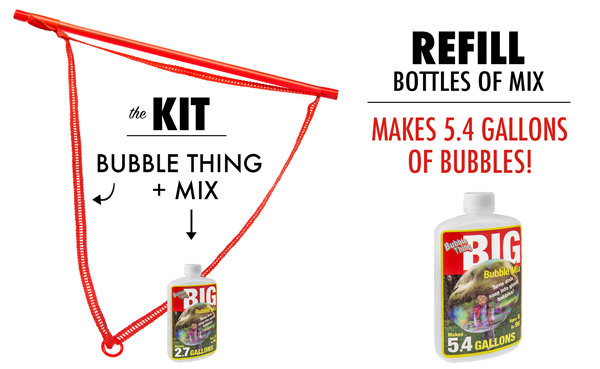 We suggest purchasing the kit plus a refill bottle for days of big bubble makin' fun! Question: Is it easy to make monster bubbles like those in the pictures above? Answer: Yes, it is! In fact, if there is a bit of wind, it'll happen on its own. Simply open the fabric loop and let the wind do the work. Otherwise, simply swing Bubble Thing through the air to create big bubbles. Question: What ages do you recommend? Answer: Bubble Thing is great for all ages — even babies love huge bubbles! However, creating bubbles with Bubble Thing should be restricted to 4+. Question: How long will the bubble mix last? Answer: A long time, indeed. 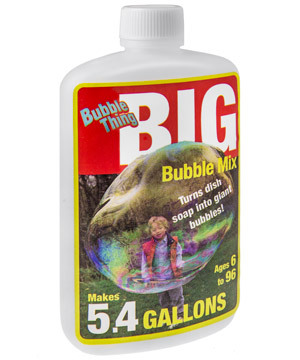 The Bubble Thing Kit comes with a small bottle of Big Bubble Mix that makes 2.7 gallons of solution! That's a lot of dips! We also sell a refill bottle of Big Bubble Mix that makes 5.4 gallons. Question: What kind of dish soap should I use? Answer: Creating the perfect solution requires hot water, Big Bubble Mix, and dish soap. There are only three brands that work: Dawn, Joy, and Fairy. Question: What are the best weather conditions for giant bubbles? Answer: Evaporation is your enemy when it comes to making giant bubbles. The higher the temperature, the faster the evaporation. The lower the humidity, the faster the evaporation. So, aim for humid days with lower temperatures and overcast or cloudy skies. That being said, we've easily made 25-footers in 85 degree temps in full sunshine with low humidity. Trust us, you're going to love Bubble Thing!